5th Annual EcoFair at the Wychwood Barns! This is an update to the previous blog, You’re Invited: Great Events in Toronto October 18 – November 10, 2013 + Toronto News & Alerts. The EcoFair is a FUN, family-oriented event that informs and inspires people to make greener choices in their homes and communities. Last year, there were more than 25 exhibitors and eco kids activities. Over 650 people came out to learn about green initiatives and achievements in the neighbourhood and in Toronto, to explore new ideas, and to share green tips and tricks. The EcoFair takes place in an eco-friendly building! 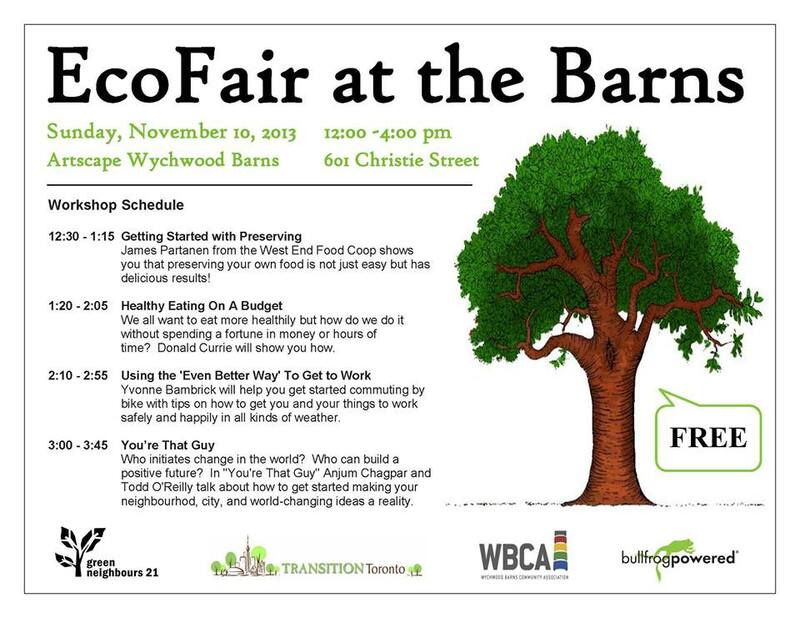 Take this opportunity to learn about the sustainable features of Wychwood Barns. Join them for eco-tours of the Barns every hour, on the half hour. Look out for building tour signs on Sunday for more information. Remember to bring your reusable mug for FREE coffee! This FREE event is organized entirely by volunteers from Green Neighbours 21, Transition Toronto, the Wychwood Barns Community Association. To volunteer for the EcoFair, please contact them by email at EcofairAtTheBarns@gmail.com. Please click here to visit Green Neighbours 21’s Facebook regarding EcoFair updates and exhibitor sneak previews.